Family Legacy has the privilege of meeting so many amazing people who take the time and care to make a difference in the lives of others. As you will see from this month’s story, Michael Harrison is one of those people who provides these things and more as a nurse with NHC Sumner in Gallatin. 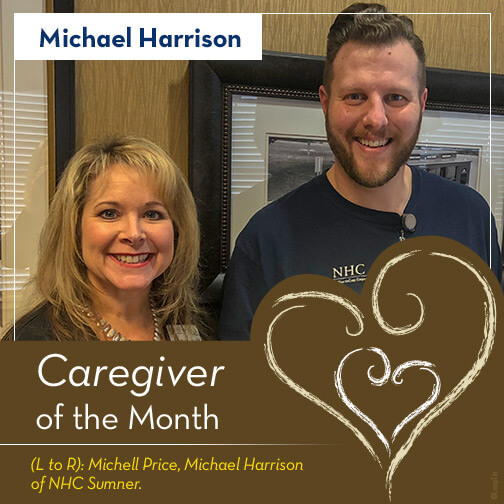 While my husband was a patient at NHC Sumner in late summer of 2018, there was an RN, Michael Harrison, who provided exceptional care to both the patient and his family. The careful attention to making sure pain relief was given promptly and the respect he showed for the personal needs for both patient and family was above and beyond our expectations. He never showed any impatience or frustration when the care was difficult. He continued his respect and caring when he came and gave condolences to the family at the funeral and visitation. Michael should be recognized as a special member of the health care team. Do you know a Caregiver? Nominate them today!